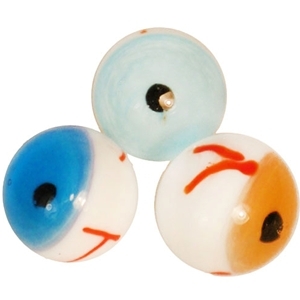 Set of three handmade glass eye marbles. They come in brown, light blue and dark blue pupils and are just over 3/4" in diameter. Colors may vary slightly. Play with them as a shooter marble, decorate for Halloween, or play tricks on your friends. So many possibilities. The colors you receive in the set will depend on what we have available. Specify in order notes if certain colors are need. Warning! : Choking Hazard. This toy is a marble. Not recommended for children under 5 years.